To get at this price, call the Price Match phone line on : 0844 875 5133. Lines are open 8am to 8pm Monday to Saturday and 9am to 5pm Sundays. Free delivery to store or free delivery to home if you spend £50 or more. 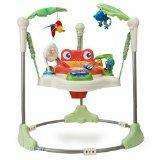 The Fisher Price Jumperoo is a great alternative to doorway bouncers. Your baby's bouncing is rewarded with lights, music and sounds. The 3-position height adjustment allows you to adjust the Jumperoo as your baby grows and the rotating seat allows your baby to explore all around them. The colourful animal toys stimulate your baby's senses, teach them about cause and effect and develop their hand to eye co-ordination. With a removable toy tray with a fixed snack tray underneath, volume control and removable, washable seat padding. The legs fold under for storage or carrying. Suitable for babies from 6-15mths. Maximum user weight 11kg (25lbs), maximum user height 85cm. WOW! great price, I paid about £20 more than this before christmas for one of these for my daughter (9 months now), and she absolutely loves it!! The look on her face when she first tried it out was worth the price of it alone, and for just over 45 notes, this is a steal for anyone with a little one, highly recommended and very entertaining. Hot OP! just saw the description and just to confirm, it does come with batteries pre installed and these are still running ok now 1 month in. good price but will mothercare price match eCrater.co.uk?? Mothercare do a price match promise - see their website for futher info. They will price match any online retailer or store or catalogue if product in stock. I tried to get them to price match their sister company ELC who had it listed at £47.49, but they wouldn't as it was out of stock, but the very helpful woman on the end of the phone suggested that I googled it as did she & we came up with eCrater as a cheaper alternative & she was only too happy to price match them for me! why will mothercare price match eCrater.co.uk?? which remind me. I need to dig it out and get rid of it! Very bad for development....hips and feet. I work for children's physio and we strongly disapprove of them. Sorry, but cold from me. They told me that they are not doing the vouchers anymore :-( Although I think it sometimes depends on who you speak to! Hot Deals don't seem to like me putting the eCrater link, but just go to their website & enter "Jumperoo" in the search box & it will come up with both the Rainforest version & the Love U Zoo one. You will struggle to get then to price match ecrater, its not a recognised online retailer, and I for one cannot find either of these products on there..
My boy loves it and can sit in it for an hour non stop just playing around on it. Well worth the price, every parent should buy one. I have a now 3 year old who started using one of these at 5 months, was walking by 7 months & running by 10 months. Hips & feet are fine, no problems whatsoever! However, I never used to let her stay in it for more than about 30 minutes at a time & no more than two or three times a day. I thought it was absolutely wonderful & she loved it! I paid this much for ours second hand on eBay...& sold it on for the same price afterwards! Great price for it. Thanks, this is a marketplace and not an online retailer or store or catalogue as per mothercare T&Cs, be very surprised if they offer a price match, also states seller is from the US. You may have just got lucky, can't believe you managed to get them to match eCrater - never heard of them before. Mothercare were funny matching Amazon when I was after my pushchair. Well, as I say, the woman at Mothercare offered to price match it for me. In my experience if you do not get any joy on their price match phone line, try again. Some staff are really helpful, knowledgeable & experienced, others are not. They actively encourage you to pricematch them. It even has the pricematch link on the product description for the Jumperoo on the Mothercare website. Jumperoos are definately on eCrater - someone has now added a link above too - thanks. Thanks, this is a marketplace and not an online retailer or store or … Thanks, this is a marketplace and not an online retailer or store or catalogue as per mothercare T&Cs, be very surprised if they offer a price match, also states seller is from the US. Very bad for development....hips and feet. I work for children's physio … Very bad for development....hips and feet. I work for children's physio and we strongly disapprove of them. Sorry, but cold from me. Are these as big and bulky as they look? I know they hold their value well but i'm not really a fan of 'toys' like this. Hot Deals don't seem to like me putting the eCrater link, but just go to … Hot Deals don't seem to like me putting the eCrater link, but just go to their website & enter "Jumperoo" in the search box & it will come up with both the Rainforest version & the Love U Zoo one. You will struggle to get then to price match ecrater, its not a … You will struggle to get then to price match ecrater, its not a recognised online retailer, and I for one cannot find either of these products on there..
Each to their own...there are always people who choose not to listen to expert advice. How do you know that you haven't done any underlying harm? I wouldn't take the risk.